You’ve researched your target list, crafted a great pitch, and sent it out to the appropriate contact. Your pitch was timely and newsworthy. Now what? How do ensure your pitch will avoid getting tossed in the trash and making it to print or the airwaves? 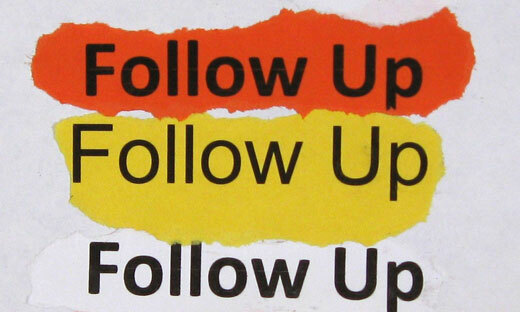 Getting attention has as much to do with the fine art of follow up as it does with the pitch itself. Think about your contact, the producer, the editor, and walk in their shoes. They are constantly on deadline getting their current news story on-air or in print and perhaps also trying to make it out the door in time to see their kid’s softball game. And all the while, your pitch lands in their mailbox amongst 100 other PR specialists vying for their attention. If your pitch is as well written as you think it is, and has a catchy subject line and lead paragraph, they might actually save it in midst of their already busy news schedule for further thought – when the time is right. But, more often a pitch can go unanswered and forgotten, if there is no follow-up – because your contact is just busy. So what do you do? AJGpr, a Los Angeles PR firm, has some tips to share. Let at least two days go by and call. Why? Because you want to remind your contact that your pitch was sent and get it back on their radar. Be Prepared – Your contact may very well be interested in your story, but remember they may also be on deadline when you call. Be cordial and ask when there might be a better time to talk. If in fact, they are interested in hearing the pitch again — be prepared to answer questions, provide quotes and facts, and offer to resend the initial pitch if necessary. Do Not Sell – This is not the time to SELL the story. If they remember the initial pitch and want to hear more – the door is open. But if they are not interested even the best sales pitch will not persuade them if they’ve already determined that the story is not a fit. So again, say thank you and move on.